It's not secret that I have a huge obsession with the classic yet fresh designs of the majorly talented Mr. Michael Kors (as documented here and here). Unlike some designers his clothes and accessories are utterly wearable; there is just something about them that can make the everyday woman feel elevated, chic, and fabulous. With the temperatures plummeting across the East Coast today I'm definitely in need of some spring dreaming in my life. 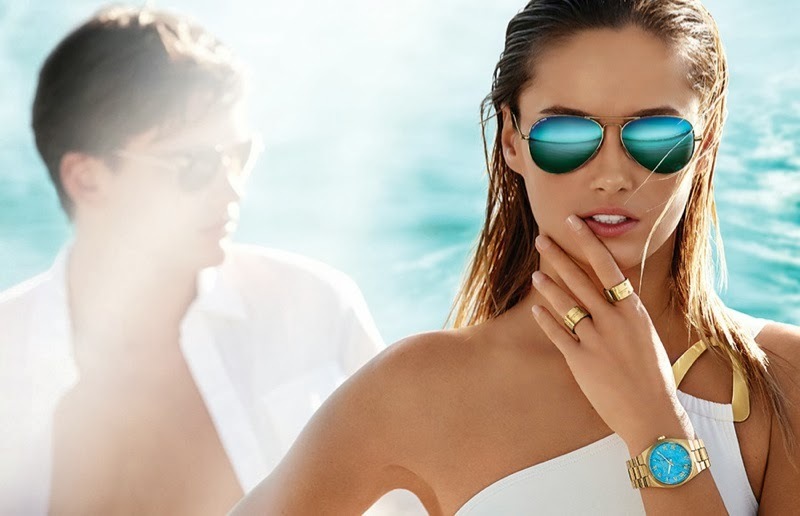 His 2014 ad campaign is totally gorgeous and absolutely makes me crave warm weather. Take a look! He always manages to make American classic look completely fresh with each season he produces. I am seriously dying over those mirrored aviators and that navy dress! Good thing my birthday is in the spring, eh? ;) What's your favorite look from his new collection? Is there a particular designer you always gravitate towards the way I do with MK? Let me know! Michael Kors is my favorite! I've been wanting a MK rose gold watch for the longest time now; that'll have to happen soon (: I definitely side with the MK craze! Love, love, love this collection. I really want the blue aviators in the picture,but are they blue or is it just the reflection of the sea and sky??? ?